Ben had purchased a bottle of Coke for the weekend, as we thought a friend as joining us for dinner. Turns out he had to cancel, and since I’ve been trying to be really good about not drinking soda I had to find a way to use up a good bit of it. Then I remembered when I made these cupcakes a few years ago and I set out on making them again, only better. For the frosting on these, I swirled a mix of cherry and vanilla buttercream so that I ended up with two separate colors. One day I’ll do a tutorial on it, but for now I’d suggest Google. But these will taste just as good with only one flavor of frosting! Big thanks to A Cozy Kitchen for the cake recipe. These tasted amazing, especially with the Coke glaze and frosting on top. These measurements are approximate, because I just do these by feel/consistency. 1. Preheat oven to 325° F (approx 160°C). Place cupcake liners into the pan. 2. Stir the butter, cocoa powder, and Coca-Cola in a medium saucepan over medium heat until the butter melts, then whisk in the sugars until smooth. Remove the mixture from the heat and set aside to cool. 3. In a large bowl, mix together the flour, salt, and baking soda. In a small bowl, beat the two eggs, then whisk them into the cooled chocolate mixture. 4. Pour the chocolate mixture to the large bowl with your flour mixture, then gently fold it in. The batter should still have a few lumps in it – but that’s okay as long as everything is mixed together. 5. Pour about 1/3 cup of batter into each of your prepared cupcake liners and bake for 20 minutes, or until a cake tester comes out clean. Allow the cupcakes to cool in the pan for about 5 minutes before removing to a wire rack to cool completely. 6. To make the glaze, mix the icing sugar with the Coca-Cola to get a thick, but runny icing (similar to the consistency I used for my cinnamon buns). Using a spoon, drizzle the glaze over the tops of the cupcakes. Don’t worry about covering the entire surface, just let it run off where it wants to. Oh, and this is best done while they’re still on the wire rack with a baking sheet underneath to catch the extra drizzle. 7. Now it’s time for the frosting. In a large bowl, use a mixer to cream the butter until it is light and fluffy. Then gradually mix in the icing sugar. 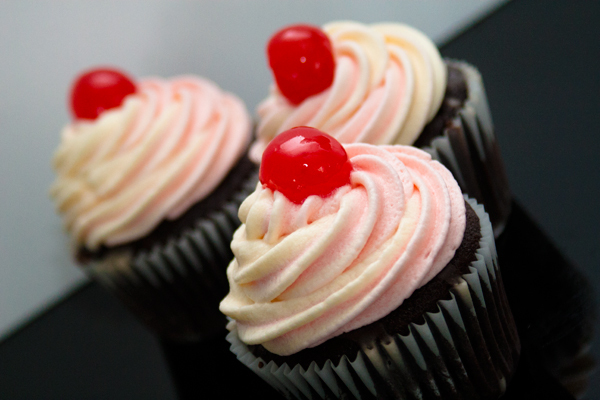 To make the cherry flavor, add in some of the syrup from the jar of Maraschino cherries as well as the red food coloring to give it a pink hue. To make the vanilla flavor, just add in the vanilla and leave the frosting white. If you’d like to make both flavors and try swirling the frosting, be sure to divide the frosting into two separate bowls before adding any flavorings. Continue to mix on a high speed for approximately 5 minutes until light and fluffy. 8. Pipe your frosting onto the cupcakes in a swirl. Then top each one with a Maraschino cherry. If you’d like to do both flavors, mix the frosting in your piping bag by filling the left half of the bag with one flavor and the right half with the other. I find this is a lot easier if you put the piping bag into a glass and place a spatula or large spreading knife down the center to keep the frostings on their respective sides. Once both flavors are in there, remove the spatula and pipe as normal!